Early 8N sales literature. On the left is a 15 page booklet from 1948 describing the new Ford tractor features, options, and accessories. 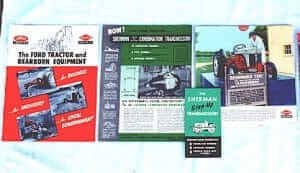 Center is a 3 page brochure listing the accessories available, including light kits, rear belt pulleys, bumpers, dual wheel kits, turbine air pre-cleaners, storm covers, all weather cabs, a folding canopy, double action shock absorber type seat, tractor jack, tire pump, grease gun and bracket, and – – a dash board installed electric cigarette lighter! 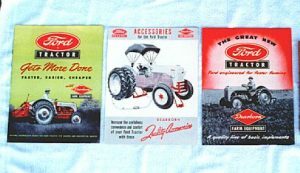 On the right is the 1947 sales brochure introducing the new Ford tractor with 22 improvements. More original literature. On the left is a four page booklet aimed at selling the Ford 8N to users other than farmers. It shows many attachments and implements that were available for use by contractors, etc. Center is sales literature for the Sherman overdrive and step-up/step-down transmissions. On the right is a ’52 Ford tractor calendar which advertises the 15,000 hour endurance test.